The reaction, called a metathesis reaction, has led Ibon to dub the material his “Terminator” polymer, in reference to Terminator 2′s T-1000. That’s an apt comparison, since this homogenous material resembles the thick liquid of T-1000′s interior. Unlike other self-healing materials, this one requires so catalyst and no layering. There’s currently no word on how well it can heal itself over multiple separations, but so long as it’s not cut in precisely the same place twice, that shouldn’t cause too many problems. There is potential for this technology to help extent the lift-spans of some plastic parts, things that are under a lot of repetitive strain often slowly acquire minute but growing fractures. The group’s main goal now is to make a harder version, perhaps one that could be formed into such parts itself. As it exists today, the polymer is squishy and somewhat soft. The researchers couldn’t stretch a single piece to breaking by hand, either before or after the cut, but it’s not rigid enough to make parts from just yet. If its healing mechanism proves robust enough, we could even see this Terminator material injected like an adhesive or a sealant. 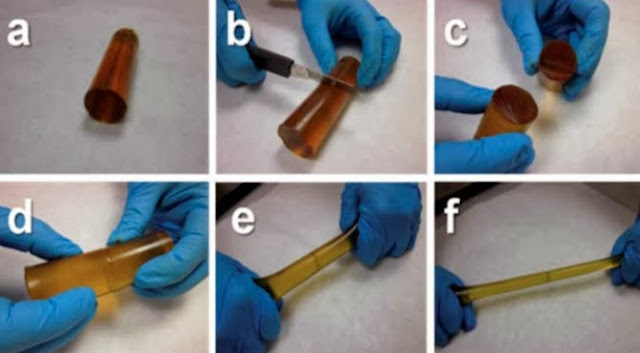 Its impressive combination of elasticity and strength could let it bring the self-healing advantage to everything from leaky window frames to painful joints in need of some padding to stop bones from rubbing together.